Discussion in 'The Junk Drawer' started by St_Worm2, Jan 22, 2018. 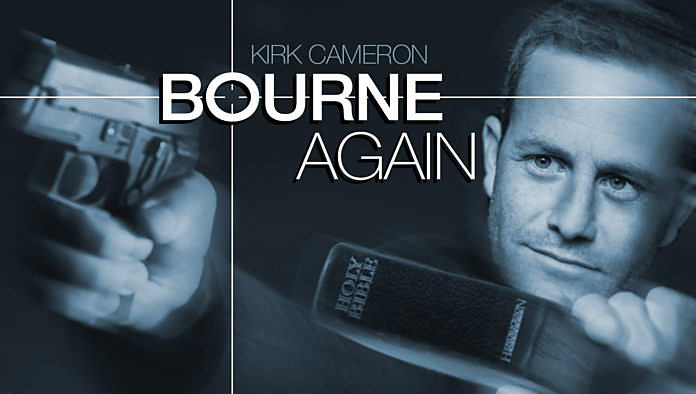 UNIVERSAL CITY, CA—The Jason Bourne films based on Robert Ludlum’s hit spy thrillers have delighted moviegoers for the past sixteen years, and now Universal Pictures is injecting the series with a shot of adrenaline with a new spinoff film starring Kirk Cameron: Bourne Again, to be released in May of next year. Cameron plays a reprogrammed sleeper assassin employed by Focus on the Family who suffers amnesia and must discover why his fellow superspies working for Dr. James Dobson want him dead. Realizing he was developed into a secret weapon in a clandestine evangelism program for $30 million, Cameron finds himself on the run in thrilling getaways and chase sequences. Unraveling the depths of the Focus on the Family conspiracy, Cameron triggers his memories by playing tracks from Newsboys albums and retraces his steps on a wild ride through Europe and the United States before confronting Dobson once and for all, according to a plot summary released by Universal. The thrilling Christian spin-off of the Bourne series reportedly has a large budget of over $150,000.00 and will be released directly on DVD and VHS. "Babylon Bee" is a fake news political satire site.